If you’ve talked to Realtors, Attorney’s, most other Real Estate Investors and your Mom, they will probably tell you that you can’t buy real estate with zero down payment and without using your credit. 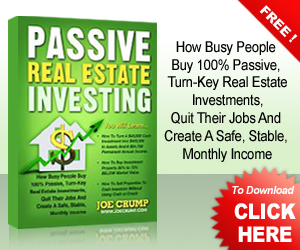 I am going to teach you how to use a 100% automated system to buy and sell property. I taught this brand new information for the first time at my last Two Day Buying Event. Although it’s been working amazingly well in it’s current version, this new upgrade and major overhaul changes everything and automates the entire process of working with Buyers and Sellers. Once it’s set up, the daily work is done for you. It is the closest thing I’ve ever created to a money machine. I know that sounds like hype, but I’m not feeding you a line here – this is the real deal. 1. You hire a freelance virtual assistant (VA) on elance or odesk. They are going to cost about $50 a week. You will use the ad I give you to post so all you have to do is copy and paste it in. It’s free to post on these services, by the way. 2. You give the VA the instructions on how to do the job. You don’t need to write these, I already have them written out for you. They come with a short series of 5 minute or less, online videos where I walk them through the simple process. They actually see my screen as I walk them through it and hear me tell them where they need to click and what they need to do. You can do this work yourself, by the way, if you can’t afford the VA – it’s not difficult. I made this training so easy that someone who only has a rudimentary grasp of English can do this work. 3. 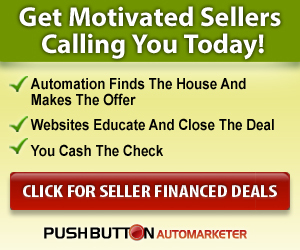 When they use the software I give them, they scrape powerful, motivated seller leads from several websites. The software does the heavy lifting and gives them anywhere from 100 to 800 new leads per WEEK to email – it’s a never ending new source of sellers and they are free to gather and free to email. And these are B2B leads for you Internet marketers out there, so emailing them is NOT spam. 4. After they send out the email, the Seller responses come in. The VA plugs them into our autoresponder and they all start getting a sequence of emails that drive them to our Seller website. A small percentage of them will read the site and fill out the online form. They will also fill out the online Lease Option Memo and give you control of their property. They do this WITHOUT talking to you! I’m not joking. Some of them will get your email, but do nothing – our autoresponder will continue to send them emails FOREVER until they sign up or unsubscribe or die. It’s amazing how many deals come in with this system months after we first contact them. 5. Once you have the deal and control the property, you need to hire a Realtor to sell the property for you. You don’t pay them, they get paid ONLY if they sell your properties and they are very reasonable. I give you the ad that we use to hire a real estate agent using craigslist. It’s an amazing ad and breaks down for them the job and what they will get paid for doing it. We get lots of responses who are ready to go, every time we run this ad in every city we’ve tried it. 6. The real estate agent is going to put YOUR sign in the yard (cost $3 dollars), take some digital pictures (their camera) and put their lockbox on the door. They are also going to contact the Seller by phone and pick up the key and introduce themselves. 7. You VA is going to post your property for sale using the online sites we tell them to use. Again, I have written this process all out for them and created videos to explain it, so there is no guesswork. 8. The Realtor is going to show the property (with their gas), work with the Buyers, get the contracts signed and collect the checks (which they deposit into YOUR account). You are going to control ALL of the leads that come in for these properties. There is an entire system with two different business web sites that I’ve created just for BUYERS and we will set it up for you. They will allow your VA to keep the Buyer leads coming in. You always want to keep control of your Buyer and Seller leads by the way – this system makes that possible without you having to mess with them yourself. 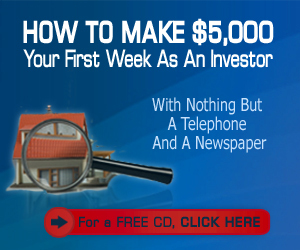 That’s it – once it’s set up and working, it will start making you money. It has worked in every market we’ve ever tested it. And if for some reason it doesn’t work for you in one area (not likely), you can always try it in another area or even MULTIPLE areas. Yes – it’s scalable! You can do this NATIONWIDE - even worldwide if you like. Are you blown away yet? 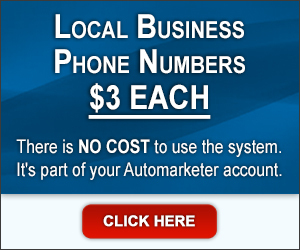 Have you ever heard of a business system that did so much of the work for you from DAY ONE? 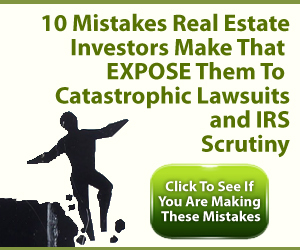 If this isn’t getting your juices flowing, you have no business being a real estate investor. There is NOTHING like this system ANYWHERE in the world. Companies spend millions of dollars to create systems like this. I had to try hundreds of different techniques before I found the right combination of automated activities, software and processes to make this work. And you can do it from ANYWHERE. You can sit on the beach and manage this entire system with nothing but your laptop and an internet connection. You can do it in 8 to 10 hours a week… often less. And here is the part that is going to make it irresistible. If it doesn’t work, you don’t have to pay me a dime. I mean it. I guarantee 100% that it will work if you do it the way I teach it. I am ONLY going to give this system to the people who come to my Two Day Buying Event here in Indianapolis, Indiana. You MUST be there to get this system. I’m going to invite all my past Six Month Personal Mentor Program students to this event for FREE. If you are a past or current mentor student and you want to come, you MUST reserve a spot (they are limited) – send me an email and I’ll get you the hotel details. 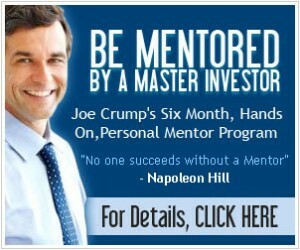 If you are not yet a member of my Six Month Mentor Program, you can sign up. I’ll put some links below that explain the program and the other things that are included. It’s NOT a cheap program, but there are some discounts if you qualify and a payment plan available (see the link below). But it cost PENNIES compared to buying a business. And if you compare it to getting a college education, it’s WAY faster and WAY cheaper. Perhaps the biggest benefit to this program is that you have ME there to help. I don’t pawn you off to some inexperienced underling – you get to speak with me personally on my conference calls, you get to meet with me personally at the events and you get access to me by email and fax. I’m going to put some links below that will explain the Mentor program, what it costs and what is included. I will also give you a video interview with me where I talk about the techniques I teach in this program. AND I will give you a video of what we do at the Buying Event (these are methods and systems in ADDITION to what I’m talking about above). If you are already a mentor student or have been one in the past and you want to come, just send me an email. I’ll put you on the list. Again – there is no charge for you to attend. If you want to sign up – don’t wait till the event to do so – you can get started RIGHT now – today. The more you learn before you come, the more you will get from the event. 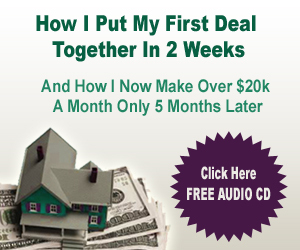 I’ll teach you how to make real offers on property without using money or credit on the FIRST day in the program. It’s phenomenal. You can also bring your spouse or business partner for no extra charge. If you are interested in signing up, call me. I want to talk to you personally and ask you a few questions to make sure you are right for the program. If you have questions that aren’t answered on the links below, feel free to call me – but please only do this if you are serious and have the resources to come. I do not allow anyone to do this program on “spec.” It would be unfair to my other students and not a good business model for me. I wish you all the best of all good things. I hope to meet you soon. Part One: A written letter from Joe that tells all about the Partner Program, the Six Month Mentor Program and the Two Day Buying Events. 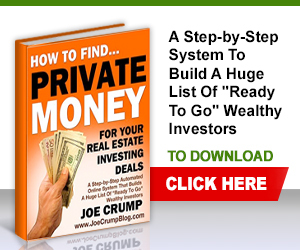 This is everything you need to know about this program, what it includes, how you can work personally with Joe, how it can get you started very quickly as a real estate investor and why Joe guarantees it 100%. Part Two: My Business Blueprint. I recorded these 7 videos for the folks on my newsletter list. 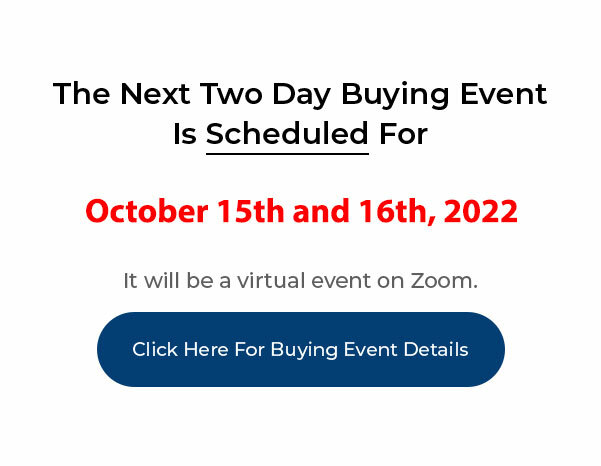 It will teach you how my business is structured and exactly how I’ve been able to build a multi-million dollar business in real estate investing and work less than 10 hours a week. It doesn’t talk about the partner program very much, but it will give you an idea of what you would learn if you partnered with me. Part Three: This is a recorded audio seminar titled, “4 NEW Methods For Investing In Real Estate That You Have Never Heard Before.” It runs 1 hour and 18 minutes and is filled with usable, practical techniques for investing in real estate with zero down payment and no credit. Part Four: Video Interviews with Joe’s Partner/Students. There are several hours of hard hitting interviews with Joe’s students if you follow this link. These students tell you exactly what works for them and what you can expect if you get involved. Part Five: Joe’s Bio. Here is who I am, where I came from and how I got here. just give me a call and I’ll get you going. Make sure you read the web page about the program before you call so you understand how it works. If you still have questions after you read the web page, feel free to give me a call. My direct line is 317-598-1220. Please don’t call unless you are serious about this opportunity and are in a position to afford it. Can you really buy houses with zero down and bad credit? The answer is absolutely yes. We’ve done it thousands of times in the last twenty years. Let me tell you how. Joe: In the hierarchy of zero down structures I teach, I show you which structure to use and how in different situations. The structure names are “Subject-to”, “Multi-Mortgage”, land contracts or contract for deed depending on whether you’re in a trust deed state or a mortgage state, lease options and then assignable cash deals. 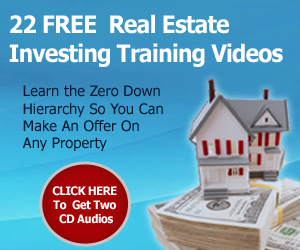 All of those are zero down structures where you can control the property, you can OWN the property or where you can actually get the deed to the property without qualifying for a mortgage or making any down payment by taking over the payments on a mortgage or creating a new note and mortgage. It’s very possible to do that. 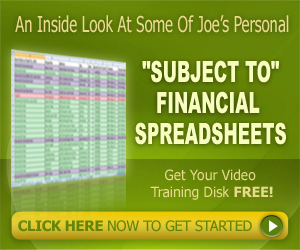 Joe: What most people think is, ‘Nobody would do that.’ But that’s not the case, clearly. We’ve done it so many times. And I’ve even created automated “Subject-To” deals. I’ve done it with the lease option method that we teach. We do a lot of this with the lease option. Joe: I call it “The For Rent Method”. This is where we go after people who have their homes for rent or for sale by owner and we show them how we can sell their property lease option and get them out from under a property, and then protect them and solve the problem of having this vacant property or a property they can’t sell. Joe: And, they love us for it. It makes it very easy to sell this. If you get good at the things I teach and learn how to talk to these people and make these offers, then it’s not a problem. Joe: There are lots and lots of these leads. If you look at the for sale by owner section on Craigslist, you’ll see the leads that we’re working with. We use an automated scraper I’ve talked about in the past, that pulls their names off of Craigslist and then sends emails out to them. It gets the people that are the most interested to reply and say, ‘Yes, I would consider that. Tell me more.’ Then, it sends them to a website which explains it to them, builds our credibility, teaches them about it and shows them why it makes sense for them to do it our way. Joe: Then, a lot of times, they’ll go right online to our lease option memo and fill out the form online and hit ‘This is my digital signature. I accept this form. Click on this.’ It sends it to us as a finalized lease option memo that we can then turn around and sell, take the assignment fee, put a buyer in there and then we’re in and out of the deal and we’re done. Joe: That’s the simplest form of it. That’s the form of it that I teach my mentor students the first day they’re in the business or the first day that they come to my Two Day Buying Event. When you come to the buying event, I teach you how to do it and we actually make offers right there at the buying event. Joe: You can learn how to do this in one day. The first day that you’re in my mentor program and the first day you buy the “Push Button Method”, you listen to one recording and make offers the second day. If you’re at the buying event, you make offers the very first day you’re there. Joe: So yes, this is very possible. It’s even a mundane question to me now. I’ve heard it so many times that it’s hard for me to get my head around the idea that people don’t understand why this would work. Joe: By the way, look at my case studies page. If you go to JoeCrump.com/partner/casestudy.html, then you can look at the case studies of my students who have done this for themselves. There are 40 or 50 different videos on there of people who have done this. So hopefully that helps you understand. Thanks. Bye, bye.